Thinking about hiring a professional Tree Surgeon in Wimbledon? GraftinGardeners has served customers all over South West London, providing premium tree surgery services for affordable prices and have tree surgeons in SW19, London and surrounding areas, ready to carry out any tree services required. We are tree care experts with the highest standards known in the arboriculture industry, and follow the guidelines in the British Standards (BS 3998), ensuring all works are carried out with efficiency and care. Whatever services you require, our tree specialists can help. Call us today for a free quotation or read on for further information. GraftinGardeners are highly skilled and professional Tree Surgeons in Wimbledon and surrounding areas. We are a family run tree company and specialize in all aspects in the arboricultural field. Our teams consist of inspectors, climbers and groundsmen, and perform all types of tree services, from pruning to felling to stump removal, we do it all. If you require tree surgery in SW19, contact us today on the number provided above. We can send a tree specialist round the same day to provide you with a formal quotation. 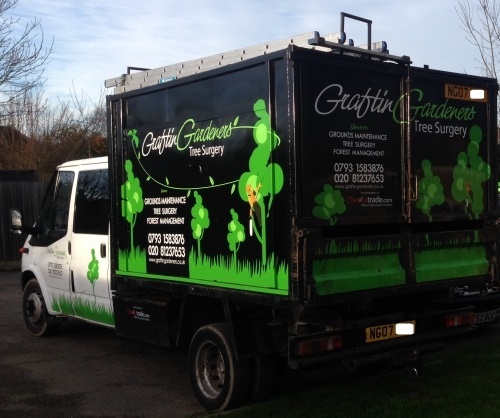 If you need a dead, diseased or unwanted tree removed from your property, GraftinGardeners can help. Everyday our tree surgeons tackle dangerous trees and can take down the largest of trees, regardless of space and location. Our tree surgeons use various rigging techniques to safely dismantle a tree in sections, or where space allows, straight fell it to the floor. We always cut down trees in a safe and well controlled manner, ensuring the safest possible removal. We guarantee none of property or surrounding will get damaged. Trust our expert tree fellers for all your felling requirements. Each tree is unique and pruning methods can differ from species to species. There are factors to consider such as age, species, location, size, character and shape before any pruning is commenced. Our tree surgeons include these factors into assessments, ensuring the optimal pruning procedures are carried out. We have been maintaining trees to high standards for many years and can cut, trim and shape all types of trees. Our company are tree care experts and closely follow the guidelines set out in the British Standards (BS 3998), ensuring all trees remain strong and healthy, before, during and after pruning. Need a tree stump removed but haven’t got the time or tools? Removing a tree stump without the proper equipment will take forever. Instead of wasting hours, trying to remove it yourself, why not let GraftinGardeners do it? Our tree surgeons have removed tree stumps in the most awkward of situations and could remove yours in no time. We have a range of hand tools and stump grinding equipment to tackle even the biggest of stumps. We will grind out the stump, fill in the resulting hole, compact the ground an even level with mulch or soil, and always leave a tidy site. Weak, diseased or dead trees fall down in stormy weather, usually leaving lots of damage and destruction in its path. Your home, car and property can get damaged. Driveways and roads can get blocked, which can cut off vital access for emergency services and generally disrupt your day. We have removed fallen trees from properties all over SW19 and can do the same for you. Our teams will come in, secure the affected area, cut up and remove the fallen tree and won’t leave till everything is back to normal. Our emergency tree service is open 24 hours a day, 365 days a year, and deals with all tree emergencies. Untrained or unmaintained ivy can be a nascence, overgrowing and affecting all types of structural elements of your home and nearby buildings. It can cause damage to exposed brickwork, guttering, roof tiles, paintwork, cracked rendering and woodwork. Our arborists are trained to remove pesky ivy and climbers fast! We remove ivy from the roots and lay down herbicides to stop it from growing back. We also offer a climber and ivy maintenance service, we can cut, trim and shape all types of ivy to best suit your requirements and can follow your instruction until we get the desired result. GraftinGardeners are tree cultivation experts. We have a brilliant understanding of tree management and can help you plant or relocate any trees. As a former gardening company, we understand what it takes to safely plant trees. We plant them in their optimal location, without causing stress and will compact it with mulch and give it some water. This will ensure the best start in life for your new tree. We can also advise on suitable specimens and give great advice on tree aftercare also. Want to get your hedges or shrubberies trimmed? GraftinGardeners have highly skilled hedge trimmers and have been caring for shrubs for over 15 years. With our experience and expertise, we can transform your messy shrubs, by skilfully crafting them into all kinds of shapes and sizes. We can cut and trim any hedge, from small box hedges, to hedgerows and large conifers, we do it all. Get your hedges trimmed by a professional today by calling our number. Pollarding is a heavy pruning method where the uppermost branches of the tree are cut all the way back, to help promote new growth and denser foliage. It also helps them to live longer, as it keeps them in an active state. Pollarding is a great way to keep trees from growing out of their boundaries and is regularly used on willow and poplar species for this reason. If you’re not sure what type of pruning your trees require, contact us on our number, we will point you in the right direction.